Collection of TCL scripts created by BLaCkShaDoW. + auto announcing for currently playing songs. + auto announcing the listeners count. + flood protection settings against those who abuse the use of commands. + added maketiny to shorten radio listen links with tinyurl. !!! Supports ONLY iceCast servers !!! ++ http package is REQUIRED for this script to work. ++ Edit the iceRadio.tcl script and place it into your /scripts directory, add "source scripts/iceRadio.tcl" to your eggdrop config and rehash the bot. !!! Supports ONLY ShoutCast v2 servers !!! ++ Edit the miniradio.tcl script and place it into your /scripts directory, add "source scripts/miniradio.tcl" to your eggdrop config and rehash the bot. 2.5.3 Most important changes (summary) **** GENERAL CHANGES - All protections supports now addition of exceptions and customization of the ban method on each word. - More major code changes for better and faster performance. --- Other new commands have been added. ---- Fixed some ipv6 bugs. **** SEEN - Code fixes and enhancements. -- Upgraded with a global seen search method. **** EXEMPT - Adds a ban exempt to the list of exempts, with optional comment and exempt period of time. **** FOR - This is a new command that will allow multiple eggdrops to execute simultaneously the same command. **** NICKSERV - Implementated a new login method that will allow the eggdrop identifying with Nickserv. **** ANTISPAM - You can now add/list/del words to be exempted. **** BAN/UNBAN - Minor bugs fixed. **** SECUREMODE - Minor bugs fixed. **** BLACK COMMAND - Minor bugs fixed. **** BACKCHAN - Minor bugs fixed. **** BADCHAN - Added a badchan scan flood protection setting with role of protecting the eggdrop from massjoin actions by stopping the on join scan of users for a period of time. * Read BlackTools MANUAL for more info about how to use it. o Tcl 8.4 or higher. 2.5.1 Most important changes (summary) **** SMALL FIXES -- Fixed some differences of eggdrop bantimes. -- All options/settings are now case sensitive. **** ANUNT --- Changed the output method of showing the adverts. **** BACKCHAN -- Minor text fixes: spelling and grammar mistakes and some differences of bantimes. --- Removed nextback-chan option. **** BADCHAN -- Added extra option 'ShowBadChan' - who sends a message to all users with OP (@/&) about the banned user and the forbidden channels on which that was found. **** BADIDENT -- Added possibility of being able to modify the banmask method. **** IDLE -- Added anti-idle option for halfop users. **** INVITEBAN -- Added exception for Undernet Official Bot *X*. **** LIMIT -- Fixed some error regarding the way on how the eggdrop sets the channel limit. **** OMSG -- This is a new command that will allow you to send specified messages to all users with OP (@/&) from a channel.. **** QUOTE -- Minor text fixes: spelling and grammar mistakes. --- Changed the output method of showing the quotes. **** TROLL -- Minor text fixes: spelling and grammar mistakes. --- Added extra option 'ShowTroll' - once activated, makes the eggdrop to display a notice message list of current trolls of the day, when users with access joins the channel (the list is reset everyday at midnight). **** VOICEME -- Added extra option 'NoLogged' - once activated, will allow the command /msg botnick voiceme <#chan> to be used and by users without a CService Username. **** MUCH MORE -- possibility for every user to set his own cmdar ( ! ) as they wish. ---- repaired a few bugs... ----- And lots of cool features for your eggdrop * Read BlackTools MANUAL for more info about how to use it. ** Read INSTALL file to know how to install it. *** Read FAQ file for the most frequently asked questions. We offer a lot of support for BlackTools - however you can also support us: Donations will help us to keep working on this project. Few of the available variable: max./min. and 'feels like' temperatures, wind speed, sun rise/set, astronomy, local time, etc. Uses apixu.com API to grab weather details..
++ add "source scripts/BlackMeteo.tcl" to your eggdrop config and rehash the bot. + completely rebuilt in a new style and with another source for weather conditions. + no multiple results, now provides more accurate informations. + added multi-languages: RO & EN. + added forecast, time & date informations. + added extra stuff for wind, UV and preassure. + added extra stuff for sunset and sunrise. Returns IPs (both IPv4 & IPv6) dns, location & organization information for a nick/IP/hostname. - added extra stuff for suspicious details as: proxy, tor and spam. - added extra stuff fo latitude/longitude, mobile and timezone date details. The script will ban all IPs which are in countries added to the blacklist. You can add both full name and/or countries shortcut. ATTENTION: You must have 'package GeoIP' for the script to work. Small protection against spam bots seding text lines with the same letters. Only checks channels you specify. + new extra option securespam, if activated, sets +m and mass voice all users on channel, but not banning on join bots anymore. + new extra option to inform, ONLY if activated, by a message all OPs (@/&) from channel about the suspected user. + also an exception list has been implemented. + minor fix for people without utf-8 installed on their machines. Ofera previziune detaliate zilnice ale horoscopului pentru fiecare semn zodiacal. complet reconstruit intr-un stil nou si cu o alta sursa web de informatii pentru horoscop. adaugate setari de protectie la flood impotriva celor care abuzeaza de folosirea comenzilor. adăugata setare pentru o zodie prestabilita fiecarui user, diferita pentru fiecare canal. adaugate informatii procentuale despre dragoste, sanatate si succes. adaugate informatii suplimentare despre numerele norocoase. adaugat suport utf-8. Semne zodiacale: Berbec, Taur, Gemeni, Rac, Leu, Fecioara, Balanta, Scorpion, Sagetator, Capricorn, Varsator si Pesti. pachetele http si json sunt necesare pentru ca acest script sa functioneze. editeaza BlackHoroscop.tcl si pune-l in directorul /scripts al eggdropului tau, adauga linia "source scripts/BlackHoroscop.tcl" in conf-ul eggdropului tau si apoi rehash.. This script searches on TclArchive website and pulls informations matching title, author, description or download link. ++ add "source scripts/TclArchive.tcl" to your eggdrop config and rehash the bot. 2.5.2 Most important changes (summary) **** GENERAL CHANGES - Major coding changes for better and faster performance. -- Added a helpful information system to show, after each info request from BlackTools manual, some important TIPS about how to use this script. --- All major protections supports now addition of exceptions and customization of the ban method on each word. ----- The bot now understands some CIDR notation and dnslookup bans. ------ All protections and ban methods recognize webirc hostmask like: mibbit.com, kiwiirc.com, irccloud.com. **** IDLE - Code fixes and enhancements. -- Minor bugs fixed. **** SECUREMODE - Added multiple random code messages for a better security. **** ANTIJOINFLOOD - Recoded and combined antijoinflood with antijoinpartquit in only one protection. **** TOPWORDS - Upgraded to show more statistical informations about: smiles, actions, questions, etc. **** NOTES - Automated abuse system to report directly to the BOSS OWNER. -- Possibility for owners to decide whether they want to receive notes or not. **** SILENCE - Added a personal protection for the bot against ctcp, notice, msg & ctcr using the server silence command. **** AWAYACTION - warn-ban-kick -- Changed the output method of showing the adverts. **** BANLIST CLEANER - Implementated an automatic banlist clean system to remove a certain number of bans when the channel banlist is full. **** BANS DISTICTIONS - Added (global) to distinguish local bans from global ones. **** CONSECUTIVE LETTERS PROTECT - Added a new protection againts chars/consecutive repeated letters. **** REPORT SYSTEM - Added a flood protection settings against those who abuse the use of command. -- Added the possibility that the report to be sent in eggdrop's PRIVMSG. **** BADCHAN - Code fixes and enhancements. -- Added extra option ShowBadChan-bwait and words to be exempted. --- Minor bugs fixed. **** BADNICK - Added extra an option badnick-bmethod. -- You can now add words to be exempted. **** BADIDENT - Added possibility of being able to modify the banmask method. --- You can now add words to be exempted. **** INVITEBAN - Added exception for Undernet Official Bot *X*. **** QUOTE - Minor text fixes: spelling and grammar mistakes. -- Minor bugs fixed. **** CP SYSTEM - Some major bugs fixed. **** SEEN - Minor bugs fixed. **** XTOOLS - Minor bugs fixed. **** LINK SYSTEM - Minor bugs fixed. **** BADREALNAME - Minor bugs fixed. **** ADD/ADDUSER/USERLIST - Minor bugs fixed. -- Removed the adduser command and included all it's functions to the add command. **** COUNT - Reintroduced count module, but only as informative thing and how to use it. **** ANTISPAM - Added exception from on-join message for all users with access. **** ANTISPAM - Minor bugs fixed. **** STATS - Reintroduced the statistics for ban commands used by each user with access. * Read BlackTools MANUAL for more info about how to use it. - pings a given destination (IPv4, IPv6 or website) and replies ping time and if is up or down. ATTENTION!!! IPv6 reply works only for those who have IPv6 active on their machine!! 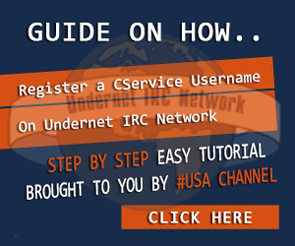 Check the status of an existing channel aplication through CService on UnderNet.